Have you ever needed insight or comfort from God's Word but didn't know where to look? This time-saving devotional tool collects Scripture on more than 400 topics, helping you to find the encouragement you need quickly and easily. The Believer’s Topical Bible contains 3,840 systematically, organized verses; Lively quotes from beloved Christians; And more. 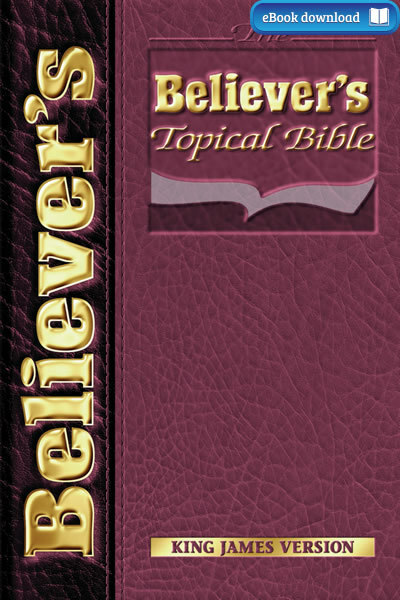 The Believer’s Topical Bible is a wonderful tool to help Christians develop a thorough knowledge of the Bible. By collecting Scripture on a topic in a single place, valuable time is saved from having to search through concordances or trying to bring up passages from memory. In a step-by-step fashion, The Believer’s Topical Bible lays out the path of life in over 400 topics covering every aspect of a Christian's relationship with God and man, and providing direction for life's daily challenges. Ideally suited for both devotional and informational reading, as well as for individual and group study, The Believer’s Topical Bible is the single reference book no Christian should be without. "The Believer’s Topical Bible is an interesting and fascinating study. I believe that it will be a blessing to the Body of Christ as they use it in their study of the Bible." --Paul F. Crouch, Founder, Trinity Broadcasting Network. “The Believer’s Topical Bible is a very handy reference source." --Doug Wead, Senior White House Staff Member and Public Liaison to the President. The Believer’s Topical Bible is a quick, convenient and thorough reference Bible designed for use in personal devotions and group bible studies. It can be an effective tool when used by pastors, chaplains and Christian workers in counseling. The Believer’s Topical Bible is an excellent resource for believers to enhance, strengthen and share their Christian faith.